In honor of St. Patrick’s Day, we here at Sugar Fix Dental Loft are in the mood to talk green. Wearing something green today might prevent you from being pinched, but there is more to it than simply adjusting your wardrobe for a day. With spring weather slowly creeping up on us, summer is on everyone’s mind. With thoughts of summer, come thoughts of the beach and swimming. Do you see what we’re getting at? What comes with swimming and beaches? Ding, ding! That’s correct: beach-ready, swimsuit-ready bodies. Go ahead and order that green beer at your local Irish pub today. Seriously, do it. It’s pretty much the one day in the entire year when you are able to find a bar that serves green beer. Control yourself, please. We don’t need to see what happens when you overdo it on the alcoholic beverages. Tomorrow it’s back to normal. Back to getting outside as the weather in Chicago gets warmer and getting fit for some good old fashioned fun in the sun. The color green will be omnipresent today. Let’s use this display of Irish-ness to remind ourselves of the benefits of green juice. The power of veggies is incredibly undervalued; especially in America where fast food and frozen meals run rampant in people’s cars and kitchens, respectively. But why would you choose McDonald’s or the microwave when you can store frozen veggies in your freezer? When you need a meal on the go, blend those vegetables together and bam! You have a green smoothie. Not craving something cold? That’s alright. 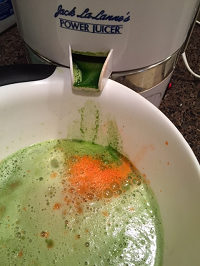 You can use a juicer to blend the veggies together and there you have it: green juice. Green juice will not only aid you in preparing for swimsuit season, it will ensure your body is receiving the proper amount of nutrients it needs (and deserves) to thrive. Sipping some green juice will give you access to natural, plant-based vitamins and minerals that will be 100% absorbed by your beautiful body. When you drink your greens, the highly concentrated enzymes, minerals and vitamins enter the bloodstream rapidly. Obviously, it’s great to eat your greens too, but every now and then drink them. Veggies in liquid form will give your digestive organs a break. Yes, even your organs deserve a little rest and relaxation. While you’re working on incorporating green juice into your diet, why not check in with your teeth? After all, your mouth is part of your body. If you’re working on your fitness, why not work on your smile? You’re going to want to grin like a maniac once you get that beach body. Call Dr. Jessica T. Emery at Sugar Fix Dental Loft today and make an appointment for a consultation. Dr. Emery will examine the current state of your oral health and work with you to make sure you have a brilliant smile to go with your brilliant body.